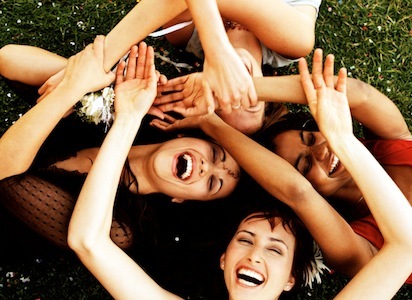 Are Female Friendships More Intense Than Male Friendships? Male friendships may lack the intimacy found in many female friendships, but men aren’t as burned by friends as women are. Female friendships are notoriously intense. They can be as passionate as the most all-consuming love affair, as close as a family bond, as supportive as the best therapist, but as toxic as the worst poison. During the episode, Katie’s friendship expert, Shasta Nelson described the five types of friendship that all women need to create a circle of meaningful friends: contact, common, confirmed, community, and committed friends. These relationships exist on a continuum for women from the most casual friends to the deepest, most committed bonds. My friend Stephanie and I have started a blogging project called HerStories: Tales of Friendship, and we’ve been asking women to share with us their stories about a friend who has shaped their lives. When we tell women, either in person or through e-mail, they have responded passionately, even if they didn’t want to express their stories in writing. They can tell you in vivid detail about all the friendships that have changed their lives. And they don’t need much coaxing. I could be wrong, but I don’t think men would have quite the same visceral response to expressing all the ways that a friend has changed them. As most men would likely agree, I think, male friendship is not the same. But are male friendships just different, or are they somehow inferior? It’s not just many wives’ or girlfriends’ imaginations that their male partners are baffled by the high-maintenance nature of female friendship. There’s a reason for this, according to male friendship expert Geoffrey Greif and the research for his book Buddy System: Understanding Male Friendship. Because men may perceive women’s relationships to be “needy,” they prefer relationships to be based on shared activity, rather than verbal or emotional expression. In short, men prefer to “do stuff” together. And women talk, cry, listen, and share more. If friendships are based on a few important things—reciprocity, self-disclosure, and intimacy—men seem to have a little more trouble with the emotional intimacy and sharing that are critical to developing and sustaining friendships over time. I’m often puzzled after my husband has phone conversations with his friends—or even goes away for an entire ski weekend—and then I press him about his friend’s relationship with his wife or girlfriend or about how his friend is coping with a new challenge. He’ll often say that what I perceive to be the most critical thing to talk about didn’t even come up in a prolonged conversation of hours or during the course of an entire weekend. But all that intense intimacy and expression can prove to be too much. Women shouldn’t be so quick to judge the seeming lack of emotional depth in male friendships. Maybe they have the right idea after all. Journalist Kelly Valen conducted a survey of more than 1,000 women about their friendships with other women for her book “The Twisted Sisterhood: Unraveling the Dark Legacy of Female Friendships” and found a mixed portrait, at best. Her research describes the unique scars that female friendship can leave, lingering even decades later. While over three-quarters of women in her survey described their female friendships as “sacred,” “essential,” “authentic” and “life-sustaining,” more than 60% of the women stated that their past relationships had caused them to be “anxious,” “cautious” or “wary” of other women. Nearly 85% of the women stated that they had suffered “terribly” because of their relationships with other women. So maybe both men and women can learn a little from each other about how to cultivate and appreciate friendships. Women can take a few lessons from men, who have fewer intimate friendships but are less prone to the complexities of rivalries, jealousy, and emotional manipulation. In turn, men can use their friendships as practice for talking about their feelings and needs. Certainly, the women in their lives might appreciate it.